Along with the changing leaves, pumpkin patches and spooky thrills, October is dedicated to the appreciation of pork. Pork is the most consumed meat around the world and serves as a very important food source for many. In the United States, the pork industry is booming with about 60,000 pork producers that raise around 115 million hogs annually. Within the pork industry, there are various systems that allow farms to operate efficiently. One of these systems is the process of ear notching. The ear notching system is fairly unique to the pork industry and helps producers keep accurate records of their animals. It is done by putting small, v-shaped notches into the ears of a pig to identify the litter and which number the pig is within the litter. Each notch correlates with a number that is calculated to give every pig on the farm a unique identity. The process of ear notching is usually done within one to three days of farrowing. It is best practice to ear notch when the piglets are young because they are easier to manage. The pig’s right or left ear refers to the ear when viewed from the rear of the pig. 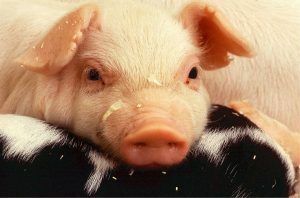 There are five possible placements to identify the pig’s litter number on its right ear, which include 1, 3, 81, 9 and 27. 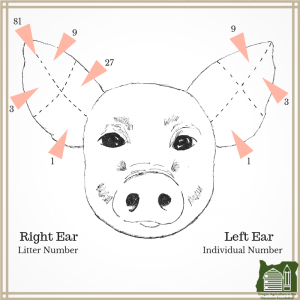 On the left ear, there are three possible locations that determine the pig’s number within its litter. The three possible numbers are 1, 3 and 9. In addition to the number placement, the ear is figuratively divided into four quadrants and within those quadrants numbers can be used multiple times. For instance, if the pig’s litter number on the farm was 16, there would be one notch in the 1 placement, two notches in the 3 placement and one notch in the 9 placement on the right ear because 1+3+3+9 = 16. Additionally, if the pig’s number within its litter was 5, there would be two notches in the 1 placement and one notch in the 3 placement on the left ear because 1+1+3 = 5. Pigs are then identified by combining both the right and left ear numbers. For example, the pig’s identification would be 16-5. 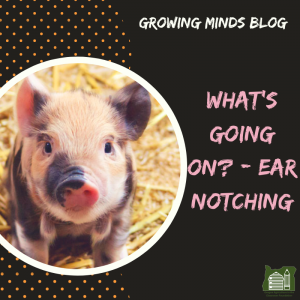 The ear notching system is used because it is an inexpensive, permanent way to identify pigs and gives all pigs an individualized identification. There are a few disadvantages to the system such as the numbers can be misread and misplaced on the ears if not done carefully. However, with an experienced team, ear notching is a very efficient way to identify pigs. As October continues to pass by, remember the importance that pork has around the globe! From ham to sausage to bacon, pork is a versatile meat that many people enjoy. This is also a great opportunity to celebrate all of the hardworking hog farmers that tirelessly strive to improve the industry and successfully raise pigs year round.